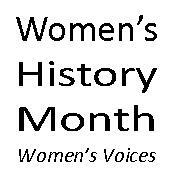 Celebrate Women’s History Month during March! The Women’s Voices library book displays include biography, memoir, poetry, and more (selected titles highlighted below). Also check out our Women’s Studies LibGuide, the Library of Congress Women’s History site, and the Smithsonian Magazine special section for Women’s History and Heritage.